Featured Is there Factual evidence of Church of England bias in the 1611? Discussion in 'Bible Versions & Translations' started by Logos1560, Nov 2, 2018.
" I have no reason to think that the translators of the original KJV had any motive but to provide the most truthful translation/interpretation they possibly could. If factual evidence exists proving otherwise, please provide it. According a consistent application of the same measures/standards that KJV-only advocates use to claim other Bible translators' bias or to question other translators' motives, I think that there would be factual evidence of Church of England bias in the 1611 edition of the KJV. For examples, there are renderings in the pre-1611 English Bibles which are considered to favor congregational church government or Presbyterian church government, and those pre-1611 English renderings are changed in the 1611 to different renderings more favorable to Church of England episcopal church government views. I would refer you to the instructions King James gave to the translators. R. Mackenzie Beverley maintained that the makers of the KJV “had ecclesiastical motives and commands to attend to in their translation” (Church of England Examined, p. 127). Charles Pastoor and Galen Johnson maintained that King James I in effect directed “that the translation adopt language supportive of episcopacy” (Historical Dictionary, p. 174). John Beard asserted that “the intense Episcopalianism of the Bishops’ Bible was transfused into that of James” (A Revised English Bible, p. 102). In his history of the making of the KJV, Adam Nicolson referred to the KJV as “a ferociously episcopal” Bible (God’s Secretaries, p. 60). Henry Jessey, a Baptist Bible scholar and pastor in the 1600's, complained about the KJV for its episcopacy and said that a prelate or bishop "who was supervisor of the present translation, altered it in fourteen places to make it speak the language of prelacy" (Williams, Common English Version, p. 53). Baptist Hezekiah Harvey asserted that the KJV "was prepared under the influence of prelacy" (Church, p. 42). James Reid referred to the KJV as “too partial to prelacy” (History of the Presbyterian Church, I, p. 239, note 24). Concerning several verses in the KJV, Andrew Edgar asserted that “prelacy” obtained “a show of countenance which is scarcely warranted” (Bibles of England, p. 294). Edgar noted that some say “the theological and ecclesiastical bias of the translators betrays itself in the authorized version” (p. 294). In his 1659 book, Robert Gell, who had been chaplain of KJV translator George Abbot, maintained that “dogmatic interests were in some cases allowed to bias the translation,” and one of those dogmatic interests he referred to as “the prelatic view” (Essay). The fact that a person with a position in the Church of England and with a firsthand association with a KJV translator acknowledged or affirmed the bias is strong evidence. John Lewis asserted that Robert Gell “reflected on this new translation as wrested and partial, and speaking the language of and giving authority to one sect” (Complete History, p. 333). Thomas Smyth referred to the KJV translators as “prelatists” and contended that they “took every occasion to make the original speak the language of prelacy” (Presbytery and not Prelacy, p. 257). Smyth noted that the KJV “was translated and arranged under prelatic direction” (p. 273). W. D. Killen indicated that “the prelatic leanings of our English interpreters” appear in their translating (Framework of the Church, p 147). James R. White asserted: “Anglican ecclesiology had an impact upon the KJV’s translation, a charge that has been made ever since the translation appeared” (King James Only, p. 72). Allister McGrath noted that “one Parliamentary group, meeting in 1652-53, argued that the King James Bible used ‘prelatic language’” (In the Beginning, p. 286). In 1645 in the sessions of the Westminster Assembly, Scottish reformer George Gillespie moved to alter “some places in the [KJV] New Testament that prelatic men make use of” (Mitchell, Minutes, p. 181). Henry Dexter maintained that “its [KJV’s] translators acted under Episcopal bias, and is some passages modified earlier and more exact versions in its interest” (Hand-Book, p. 15). William Carpenter asserted: “In some cases, the translation has been influenced either by the desire of the translators to conform it to their royal master’s prejudices in favour of episcopacy, or, which is equally probable, to render it accordant with their own sentiments on this subject” (Guide to Practical Reading of the Bible, pp. 58-59). In the preface to his 1798 translation, Nathaniel Scarlett claimed that “as the translators were laid under restraint by the King, they were a little too compliant in favouring his particular notions; therefore, their translation is partial” (p. iii). Samuel Cox acknowledged that some renderings in the KJV “have been attributed to ecclesiastical bias” (Expositor, III, p. 301). Edward Jacob Drinkhouse referred to “the Episcopal bias” of the King James translators (History of Methodist Reform, p. 260). Benjamin Hanbury contended that certain renderings in the KJV makes it “sectarian and the symbol of a party” (Historical Memorials, footnote pp. 1-2). Here are the rules for the Translators. 3. The Old Ecclesiastical Words to be kept, viz. the Word Church not to be translated Congregation &c.
13. The Directors in each Company, to be the Deans of Westminster, and Chester for that Place; and the King’s Professors in the Hebrew or Greek in either University. 14. These translations to be used when they agree better with the Text than the Bishops Bible: Tyndale’s, Matthew’s, Coverdale’s, Whitchurch’s, Geneva. The third rule was that "the old ecclesiastical words to be kept; as the word church, not to be translated congregation, etc." After listing this third rule, Adam Nicolson commented: “Bancroft, and almost certainly the king, was not prepared to give any ground in the language of the translation to the Presbyterians” (God’s Secretaries, p. 75). David Daiches noted that the third rule was "directed against the Puritan tendency to abandon the traditional terms which had associations with Catholic ritual and is an interesting reflection of the essentially Anglican nature of A.V." (The KJV of the English Bible, p. 169). John Nordstrom asserted that the third rule “reveals Bancroft’s Anglicanism more than any other and shows that Bancroft wanted to guide the new revision back to a high-church position, taking away any congregational power” (Stained with Blood, p. 169). Was this third rule also a possible attempt to satisfy and answer the written objections of Roman Catholics Sir Thomas More and Gregory Martin concerning earlier English translations? David Norton suggested that “following More and Martin, ‘the old ecclesiastical words [are] to be kept, viz. the word ‘Church’ not to be translated ‘congregation’” (History, p. 620. In his introduction to Tyndale’s New Testament, David Daniell noted: “Of the words to which Sir Thomas More took exception so bitterly, the most objectionable was ‘congregation’ instead of ‘church’ for ekklesia” (p. xxi). One of the reported 14 changes made by a prelate or prelates in the 1611 KJV according to Thomas Hill’s 1648 sermon involved 1 Corinthians 12:28. Benjamin Hanbury quoted the following from the preface to the reader in the Just Defence of the Petition for Reformation that was printed in 1618: “1 Corinthians 12:28 is translated, both by the Genevan and former Church translation [Bishops’] ‘helpers, governors,‘ but the new translators, herein worse than the Rhemists, translate it ‘helps in governments;‘ foisting into the text this preposition ‘in.‘ Why? They cannot abide elders to assist the minister in governing Christ’s Church. So their churchwardens are but the prelates’ promoters” (Historical Memorials, I, p. 131). In his exposition of Ezekiel, William Greenhill (1598-1671) asserted that 1 Corinthians 12:28 “is faulty in this place, reading those words thus, ‘helps in government,‘ which was done to countenance all the assistants prelates had in their government” (p. 551). In his 1648 sermon, Thomas Hill maintained that helps in governments “is a most horrible prodigious violence to the Greek words; for they are both the accusative case, helps; there are elders; governments, there are deacons; now to obscure these, you must put it, helps in governments” (Six Sermons, p. 25). There is factual evidence from the writings of Bishop Thomas Bilson, co-editor of the 1611 edition of the KJV with Miles Smith. In his 1593 book advocating that prelatic or Episcopal church government is apostolic, Bishop Thomas Bilson acknowledged that some use 1 Corinthians 12:28 as one verse that they cite for Presbyterian church government. Bilson wrote: “There remained yet one place where governors are named amongst ecclesiastical officers, and that is 1 Corinthians 12” (Perpetual Government, p. 197). Bilson wrote: “Why should they not be lay elders or judges of manners? Because I find no such any where else mentioned, and here none proved. Governors there were, or rather governments” (p. 199). Bilson claimed that “Chrysostom maketh ‘helps’ and governments’ all one” (p. 212). In 1641, George Gillespie maintained that “Chrysostom, expounding this place, doth not take helps and governments to be all one, as Bilson hath boldly, but falsely averred” (Assertion of the Government of the Church of Scotland, p. 19). The 1611 edition of the KJV does exactly what Bilson suggested by connecting the words “helps” and “governments” with “in.” David Norton pointed out: “1611, uniquely and apparently without justification from the Greek, reads ‘helps in governments” (Textual History of the KJB, p. 34). Was this change deliberately introduced in order to attempt to take away a verse that had been used by those who advocated Presbyterian church government? Did Bilson or other prelates take advantage of their position to attempt to undermine or obscure a favorite text used to support Presbyterian church government? What truth of the original demanded that this change be introduced into the 1611? In 1641, Scottish reformer George Gillespie wrote: “We cannot enough admire how the authors of our new English translation were bold to turn it thus, ’helps in government,’ so to make one of two, and to elude our argument” (Assertion, p. 19). Andrew Edgar suggested that Gillespie “recognized in these words a covert attack on the constitution of the Church of Scotland” (Bibles of England, p. 299, footnote 1). In 1646, Gillespie wrote: “Whereas he [Mr. Hussey] thinks, helps, governments, to belong both to one thing, there was some such thing once foisted into the English Bibles; antilepsis kubernesis was read thus, helps in governments: but afterwards, the prelates themselves were ashamed of it, and so printed according to the Greek distinctly, helps, governments” (Aaron’s Rod, p. 103). Are any of these quibbles hindering the work of the Holy Spirit in convicting sinners or being the comforter to God's children? No, but it does show to us that as decent a translation as it was, not the perfect English translation unto us! Is it possible or expected that a room full of sinners charged with producing a perfect document from ancient scripts (perhaps imperfect documents) will succeed? The KJV is imperfect compared to what document? The originals, as all translations would be! That's got to be one of the most contrived examples proffered, of these supposed instances of Bible 'Episco-plotting.' LOL, the verse is about Judas Iscariot! Not someone who'd be cited to, to bolster ones church governance scheme. What a howler. Compared to the very Old Testament texts and Greek New Testament texts from which it is translated and the very pre-1611 English Bibles of which it is a revision. One of the makers of the KJV refutes your incorrect opinion. There is actual sound evidence that Acts 1:20 is used by the Church of England to support the Church of England's doctrine of apostolic succession, which relates to their church government view. In 1593, Bishop Thomas Bilson, who would be co-editor of the 1611, had quoted Acts 1:20 as “his bishopric let another take” and had used this verse as his basis for his question “will you grant, that an apostle doth not differ from a bishop” (Perpetual Government, p. 291). Bilson contended that “Peter himself calleth the apostleship ‘a bishopship’” with the reference Acts 1:20 (p. 296). Thus, Bilson, one of the makers of the KJV, used the rendering “bishopric” at Acts 1:20 as part of his arguments for the divine origin of episcopacy and for apostolic succession. Bilson also claimed that “I am sure all the fathers with one mouth affirm the apostles both might be and were bishops” (p. 295). Bilson asserted that “whatsoever becometh of the names, it cannot be denied but the apostles had that power of imposing hands, and delivering unto Satan, which they after imparted unto bishops” (p. 296). Bilson claimed: “as by imposing of hands, so by succeeding in the chair, have bishops ever since the apostles’ times been severed from presbyters in the church of Christ: which to all that do not eagerly seek to captivate the truth to their own desires, is an argument unrefellable, that the first placing of bishops above presbyters was apostolic” (p. 332). Henry Dexter asserted: “If Judas had had a bishopric, he must have been a bishop; and if Judas had been a bishop, then the man who was to take the vacant place would be a bishop; and the twelve were all bishops” (Hand-Book of Congregationalism, p. 25). Abel Stevens asserted that this doctrine of apostolic succession “is the basis of the arrogance and pretension of the prelatical system” (Essay on Church Polity, p. 62). The Barnhart Dictionary of Etymology noted that bishopric is a compound of two words: bishop [overseer] and rice or ric [realm, province, dominion, power] (p. 95). 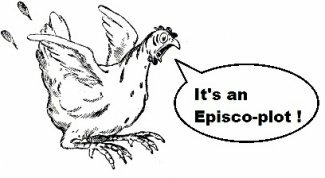 White’s Dictionary of the King James Language noted that “a bishoprick is ‘the realm or province over which a bishop has control” (p. 168). Does White’s definition of this English word match the meaning of the Greek word? Ross Purdy contended that “what bishopric meant to the English mind was that it was the diocese of a ruling bishop” (I Will Have, p. 58). In his comments about this verse in his commentary, Adam Clarke asserted that “surely the office or charge of Judas was widely different what we call bishopric, the diocese, estate, and emoluments of a bishop” (p. 687). In his commentary on Acts, J. A. Alexander observed that the rendering bishopric “suggests foreign ideas by its modern usage and associations” (p. 30). Did a diocesan bishop want to use a rendering that could convey a hierarchal sense that a bishop has a bishopric, diocese, or realm? Is the rendering “bishopric” more favorable to Episcopal or prelatic views and to Bancroft’s and Bilson’s claim that bishops were of divine origin than the rendering “charge“ or “office?” In his 1853 commentary on Acts, Abiel Abbot Livermore claimed that “this rendering [bishopric] betrays its Episcopalian origin” (p. 22). Andrew Edgar asserted that “the prelatic word ’bishopric’ appears in Acts 1:20” (Bibles of England, p. 295). Some may attempt to excuse or justify the KJV’s rendering “bishoprick” because this same rendering had also been used in several earlier English Bibles. John Wycliffe, William Tyndale, and Miles Coverdale may have used this rendering in a different sense with the meaning “office” or “overseership.” The Oxford English Dictionary gave this as an “obsolete” meaning of the word and cited Acts 1:20 in Wycliffe’s Bible and the 1535 Coverdale’s as examples of this use (II, p. 224). After Archbishop Richard Bancroft and Bishop Thomas Bilson advocated their new theory of the divine origin of episcopacy and apostolic succession, the word bishoprick became associated with a specific hierarchical sense or meaning as this rendering was used to argue for apostolic succession in a book written by Bilson in 1593. Based on the clear, first-hand evidence in Bilson’s book, it was and is valid for believers to think that the rendering bishoprick was intended by them to be understood with a different meaning in the 1611 KJV than that intended by Wycliffe, Tyndale, or Coverdale. If this different sense or meaning was not actually intended, Bilson could not have linked his apostolic succession argument to this rendering at Acts 1:20. The meaning affixed to bishoprick by Bilson and Bancroft for readers who were members of the Church of England should not be explained in a manner inconsistent or even contradictory to their known sentiments and the meaning that they intended for it. If “bishopric” was possibly considered one of the ecclesiastical words, it would be additional compelling evidence that indicates that it was used in a specific hierarchical sense to advocate apostolic succession and not in the earlier general sense. In the 1610-1611 edition of his book first printed in 1590, KJV translator Hadrian Saravia asserted: “St. Peter, himself an Apostle, calls the Apostleship of Judas his Bishopric” (Treatise, p. 192). In a book printed after 1611, KJV translator Lancelot Andrewes also cited Acts 1:20 for his assertion that “the apostles were called” “bishops or overseers” (Pattern, p. 359). Andrewes maintained that “upon these [bishops] was transferred the chief part of the apostolic function” (Ibid., p. 355). Purdy contended: “They made a conscious choice to retain the language here that glorified and seemingly sanctioned their church organization; one run by the ordained bishops. This gives those who are ordained the appearance of a connection with the apostles and supports the Roman Catholic doctrine of apostolic succession adopted by the Anglo-Catholic Church. The king and his bishops used the new Bible as a tool to promote their agenda of absolute monarchy and episcopacy” (I Will Have, p. 58). Was the rendering “bishopric” used in the 1611 KJV in order to uphold the error of the doctrine of apostolic succession? Hierarchical church government views are often connected to a claim of apostolic succession. Firsthand evidence from the writings of Bilson, Andrewes, and Saravia, three of the makers of the KJV, would demonstrate that the KJV’s rendering “bishopric” at Acts 1:20 was linked to the Church of England’s claim of apostolic succession. Has anyone made a more correct translation from these documents? I wonder why the original KJV translators made the supposed errors they made? Has anyone made a more correct translation from these documents? In at least some places, one or more of the pre-1611 English Bible translators made a more correct or accurate translation than that found in the 1611 edition of the KJV. For example, the 1560 Geneva Bible had the correct translation "Jehoiakim" at 2 King 24:19 while the makers of the KJV kept the incorrect translation "Jehoiachin" [the name of the wrong king] uncorrected from the 1602 edition of the Bishops' Bible ["Joachin"] in the 1611 edition. The 1560 Geneva Bible had the correct translation and name of the correct group "Ammonites" at 1 Kings 11:5 while the makers of the KJV kept the name of the wrong group "Amorites" uncorrected from the 1602 edition of the Bishops' Bible in the 1611 edition. I wonder why the original KJV translators made the supposed errors they made? The Church of England makers of the KJV were imperfect men who could make mistakes or errors. The Scriptures do not teach that they were given any direct miracle of inspiration to keep them from making mistakes in their textual-criticism decisions, Bible-revision decisions, and translation decisions. Some mistakes may have come from their imperfect sources such as the Hebrew-Latin lexicons which often gave renderings from an edition of the Latin Vulgate of Jerome as the meaning of Hebrew words and Hebrew-Greek lexicons which often gave renderings from the Latin Vulgate of Jerome as the meaning of Greek words, and the Roman Catholic Latin Vulgate was not a perfect source. Some mistakes could be the result of their Church of England bias, their own Church of England doctrinal views, and the rules that they were given, all of which encouraged them to follow renderings that favored Church of England doctrines. The Church of England makers of the KJV kept some errors from their imperfect sources such as the examples where they kept errors uncorrected from the 1602 editions of the Bishops' Bible.